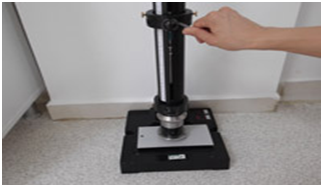 MAGNETIC METHOD; specifies a method for non-destructive measurements of the thickness ofnon-magnetizable coatings on magnetizable base metals. 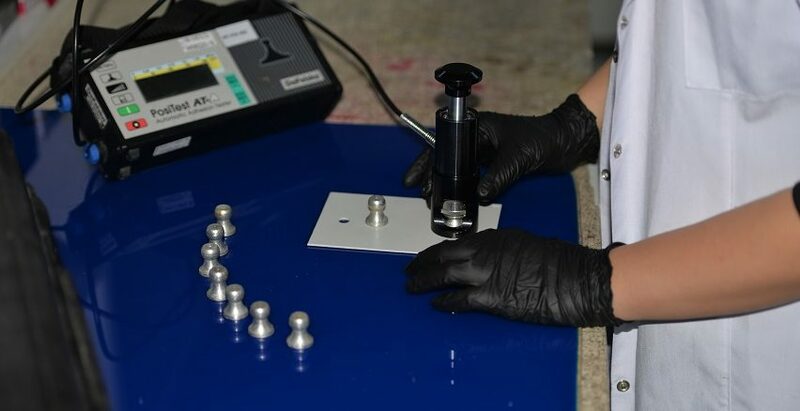 The measurements are tactile and non-destructive on typical coatings.The probe or an instrument with integrated probe is placed directly on the coating to be measured. 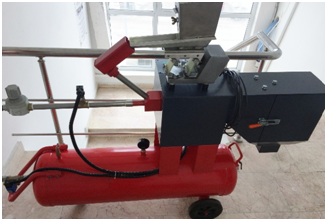 The coating thickness is displayed on the instrument.The magnetic flux density close to a magnetic field source (permanent magnet or electromagnet)depends on the distance to a magnetizable base metal. 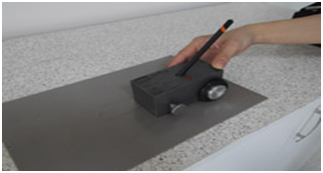 This phenomenon is used to determine thethickness of a non-magnetic coating applied to the base metal. 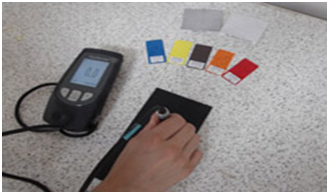 With this test method we can find the adhesion grade of the coatings with film thickness less than 250 µm. 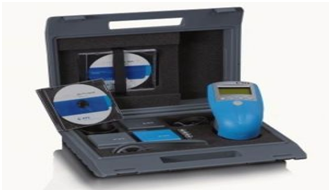 This test can be performed on coating systems or single coatings on metal, wood or soft substrates. 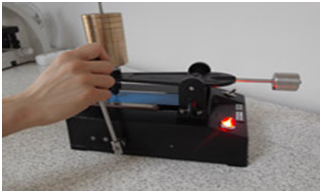 Different cutting equipment will be used for different film thicknesses. 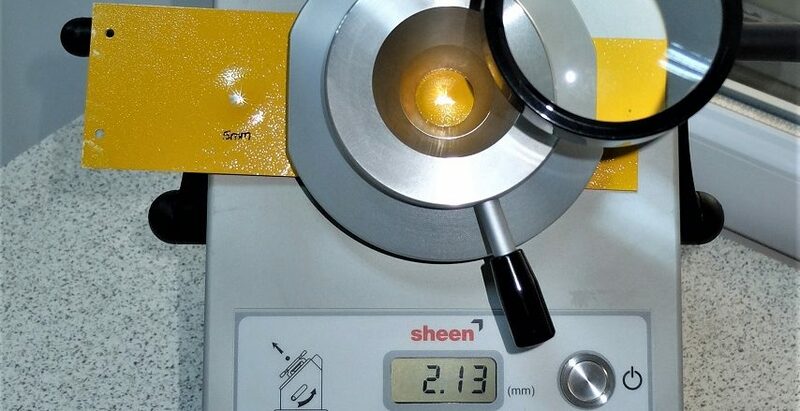 With this test method we can find the adhesion grade of the coatings with film thickness more than 250 µm. 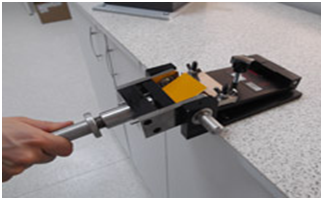 This test can be performed on coating systems or single coatings on metal, wood or soft substrates. 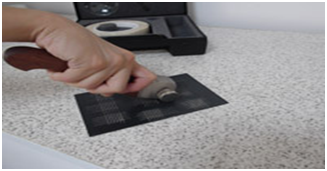 Adhesion resistance will be given as Psi or MPa. 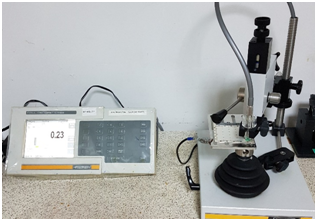 With this test method, especially organic coatings are being tested by firing certain amount of steel pellets at certain pressure and time period at the test specimens. 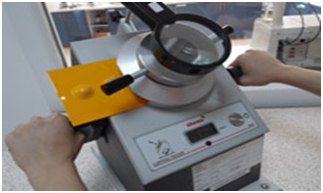 We evaluate the resistance to chipping of the coating. 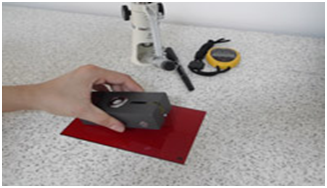 This test methodis being used for assessing the resistance of a coating of paint, varnish or related product to cracking and/or detachment from a metal substrate when subjected to gradualdeformation by indentation under standard conditions. 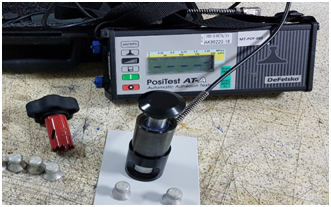 This test method is being used for assessing the resistance of a coating of paint, varnish or related product to cracking and/or detachment from a metal or plastic substrate when subjected tobending round a cylindrical mandrel under standard conditions. 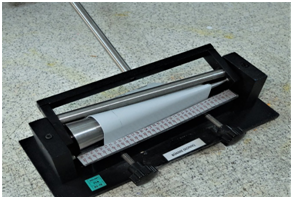 This test method is being used for carrying out an indentation test on a single coating or multicoat system of paint, varnish or related product, using a Buchholz indentor. The length of the indentation produced is indicative of the residual deformation of the coating. This method is to assess the relative hardness of an organic coating on ametallic substrate, by means of pencils of known hardness.Smooth surfaces will give more accurate results, but the method is also applicable for textured surfaces. Themore pronounced the texture, the greater the unreliability of results. 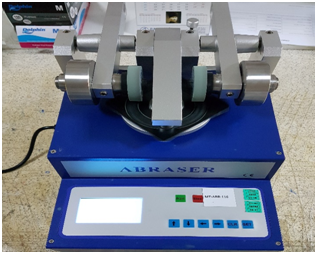 This test method is being used for determining under defined conditions the resistance of asingle coating or a multi-coat system of paint, varnish or related product to penetration by scratching with ascratch stylus loaded with a specified load. 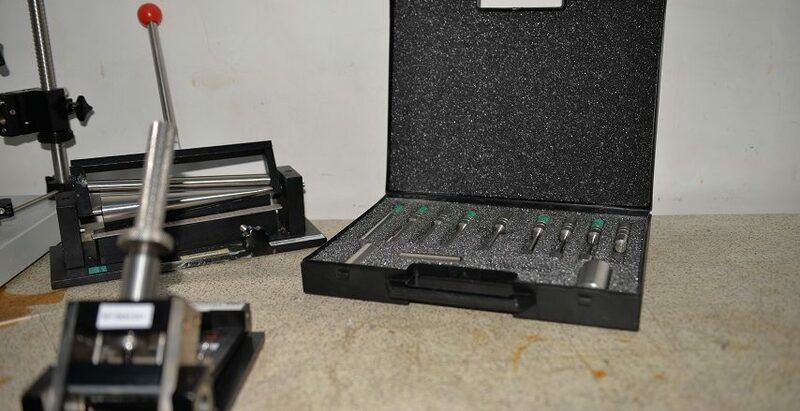 Penetration of the stylus is to the substrate, except in the case of amulti-coat system, in which case the stylus can penetrate either to the substrate or to an intermediate coat. 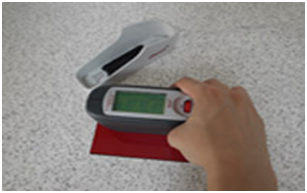 Gloss value is being determined by using reflectometer and gloss value can be determined in three different geometries: 20°, 60° or 85. 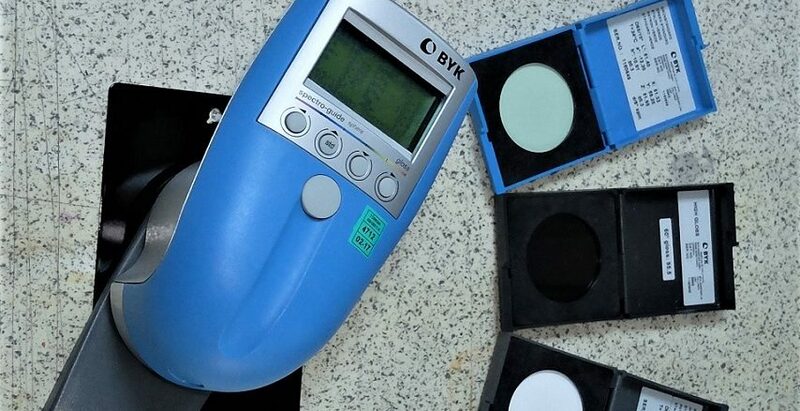 Also with the help of color spectrometer, we can determine the L, A, B values and calculate the color change (∆E). 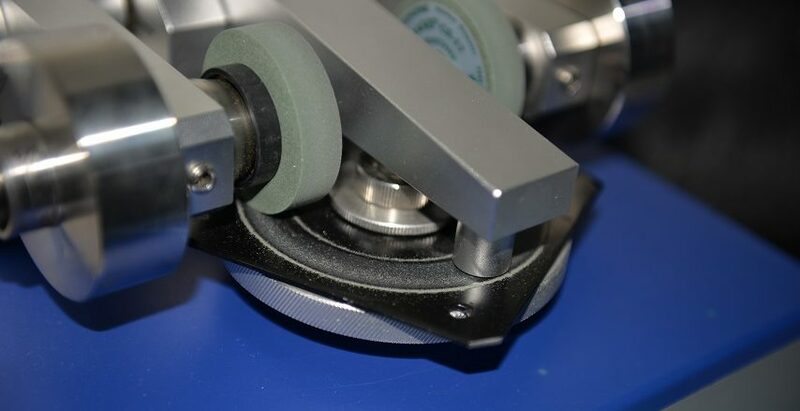 This method is being used for determining the resistance to abrasion of coatings, forwhich two loaded, freely rotatable but eccentrically arranged abrasive rubber wheels affect the coatingof the rotating test specimen. Results are given as g/m2. 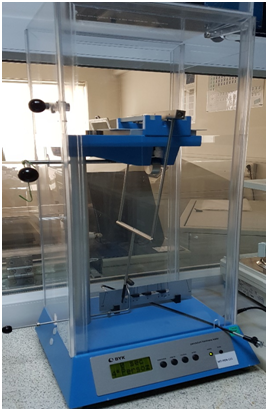 A pendulum resting on a coating surface is set into oscillation and the time for the oscillation amplitude to decrease by an amount and this amount is measured. The shorter the damping time, the lower the hardness.